I want so much to be able to give it 5 stars, but as others have mentioned there were just times that I felt it was a chore to finish reading this. Not that there isn’t great world-building, interesting characters, or an exciting premise, but somehow it just didn’t all come together for me. But admittedly, part of it is just a personal issue, in that given that the original Kushiel’s Legacy series is my ultimate favorite ever – I tend to hold everything else to that standard and it’s a hard act to follow. Obviously I liked it well enough to still give it 4 stars, which does include well deserved extra bonus points for not taking the easy way out when writing a character with a disability. I was hesitant going in to Starless. I have long adored Phedre no Delauney, and I confess that I had doubts that Carey could create something as wondrous and have it be DIFFERENT. I am so glad to be proven wrong. 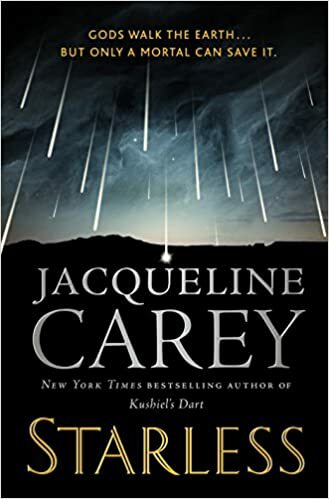 As with the Kushiel series, Carey touches on aspects of our identities with a gentle hand, revealing truths about love, self image, gender politics, family and more, without getting overly preachy or pushy. I am very disappointed, however, that there is not another book waiting in the wings. The ending is a smidge rushed. Not disappointed enough to knock a full star off, though. Carey has once again created for us a lush world of prophecy, gods, and chosen, and of course love. While not as original and breathtaking as Terre d’Ange, this is well-applied fantasy tropes for a compelling read. In addition, the protagonists are unusual for fantasy in a few ways, which I won’t elaborate on so as not to spoil plot points, but wonderful to see such diversity particularly in this day and age. If you’re a fan of Carey’s work, or of epic fantasy, you’ll enjoy this novel. She has said it’s stand alone – I hope she changes her mind and creates a sequel!